Infinite Cedar Raised Garden Bed by Smart Carts at Tulips Orchids. MPN: RAISEDBED-3X3. Hurry! Limited time offer. Offer valid only while supplies last. 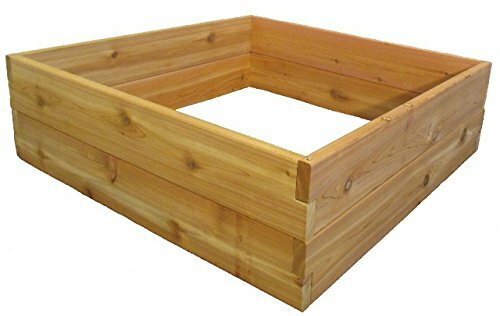 The Infinite Cedar Raised Garden Bed, is available in 2 sizes. Made from long lasting Western Red Cedar, a durable and naturally rot-resistant wood. The Infinite Cedar Raised Garden Bed, is available in 2 sizes. Made from long lasting Western Red Cedar, a durable and naturally rot-resistant wood. Simple assembly in just minutes, the raised bed corners are half-lapped, with rods placed down through the assembly which keeps corners from working loose over time. Its also easy to stack the boards to make raised beds in many different heights if you choose with multiple units. Superior strength and quality with no screws or nails to rust over time or come loose from swelling and shrinking of the wood due to the elements of weather. The wood is all natural, no chemical treatment was applied. All boards are standard sturdy deck boards 1.25 x 6 in. surface with actual dimensions of 1.0 x 5.5 in., two boards stacked on top of each other give the raised bed its height of 11 inches. Made of Western Red Cedar, it can be stained or painted or left unfinished to gray naturally. Hardware like screws and nails eventually loosen as wood ages, these beds assemble with rust-free aluminum metal pins set securely through the ends of each board. So after years of exposure, it won't fall apart, and can be disassembled by hand if needed for moving or storing over the winter. This product is proudly Made in USA. Comes with a 5 year Manufacturer Warranty. Available in sizes: 3L x 3W ft. x 11H inches 3L x 6W ft. x 11H inches Muller's Garden Carts, including the revolutionary and legendary Smart Cart, have been made in the U.S.A. since 1975. They're designed to be stable, easy-to-use, lightweight, and longer- lasting than any comparable product. Using high-grade materials and thoughtful design, Smart Carts are accessible, fun, and totally essential for the clever gardener. Raised bed garden planter. Available in 2 sizes. Made from long lasting Western Red Cedar. Easy assembly in minutes with no tools. Superior quality, made in USA. All natural, no chemical treatment to the wood. If you have any questions about this product by Smart Carts, contact us by completing and submitting the form below. If you are looking for a specif part number, please include it with your message.